Sorry we are sold out of Tanzania Kilimanjaro Peaberry. Arrived September in grainpro bags, Tanzania Kilimanjaro Peaberry, is grown in one of the most unique micro-climates in the world, near Mount Kilimanjaro. For those who may not be familiar with the peaberry, it is a common seed mutation. The bean develops into an elongated pearl shape, forming just a single seed or coffee bean, as opposed to typical flat beans. Most coffee cherries have two opposing flat seeds at their center but the peaberry has but one. Generally, about 3 percent of a coffee crop contains peaberry, and as in this case, they are separated from from flat beans. Peaberries have different roasting and flavor characteristics; due to their shape they roll easily in drum roasters (Behmor, Hottop, Gene) and are less prone to scorching; in hot air roasters (Fresh Roast et al) they do not circulate as well in the airstream as they have less surface area. In taste, they have a somewhat increased flavor concentration. Kilimanjaro offers excellent conditions for growing coffee: highly fertile rich, red volcanic soil, a moderate tropical highland climate, gentle mountain slopes, access to a great number of sources and springs and a mild mountain climate due to the vicinity of Kilimanjaro. Day and night differ only moderately in temperature. In the background, the plantation has a breathtaking view of the 19,000+ foot, snow capped Mount Kilimanjaro. Bourbon is the dominant varietal here along with Kent, and the farm has extensive shade from more than 10,000 trees which have a favorable influence on the climate and encourage diversification of bird species. The Kilimanjaro Plantation is one of the largest and most technologically advanced coffee farms in Tanzania. All processing takes place at the farm using traditional wet method processing: depulping, tank fermentation, washing, grading. 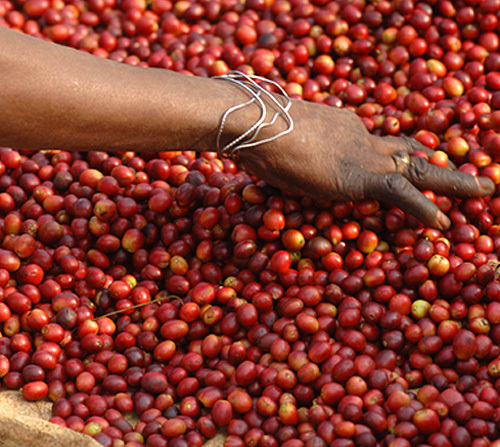 Coffee is dried on tables with good ventilation and are regularly turned and inspected for defects. Careful exposure to sunlight lowers the humidity level from 55% to 12%. Finally the coffee is stored in ventilated conditioning bins where beans attain a homogeneous moisture of 11% as well as a uniform color. The farm is ecologically minded, with a drip irrigation system that uses 60% less water than traditional system. To clean the effluent from washed processing Kilimanjaro Plantation has devised a specific water treatment system in collaboration with the University of Braunschweig that allows an almost complete cleansing. Cup Characteristics: Sweet, complex cup with mouth-filling qualities. Citrus acidity. Maple, sugar cane, nutmeg. Roasting Notes: Can be roasted successfully through most ranges but best approaching full city or terminating the roast just at the outset of second crack. In hot air roasters use a little less than you would of flat beans. In drum or drum-type roasters these beans will roll around nicely and produce an even roast. With a Behmor try P3.